Continuing our series looking at how policy and non-digital teams are using digital tools and approaches to undertake their work, we have a guest post from Emily at the Human Tissue Authority on doing User Research as part of a Discovery. Ben Showers (Digital Assurance Lead). Hello, my name is Emily and I’m currently on a Fast Stream secondment to the Human Tissue Authority (HTA) as a Digital Development Manager. 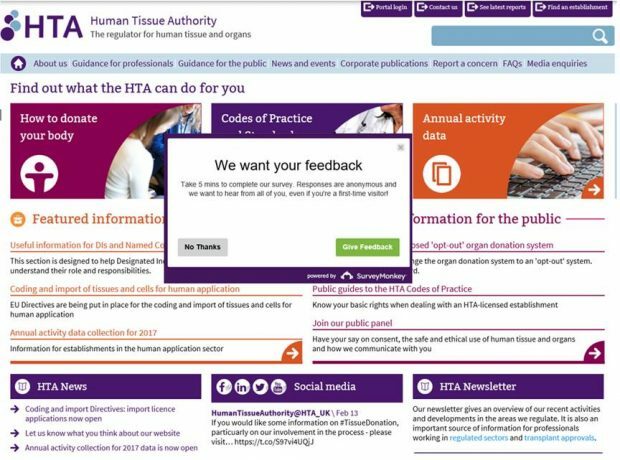 For those who haven’t heard of us, the HTA has a really interesting role as an Arm’s Length Body of the Department of Health and Social Care (DHSC) - we regulate organisations that remove, store, and use human tissue and organs! Due to our unique role, we have two main user groups: our professional stakeholders and the general public, who we would like to engage with more to gain their feedback. To do this, we thought that an online forum would be a great way to interact with our two different user groups. However, we hadn’t undertaken any user research, so did we really know what our users wanted? And was this the kind of service that would meet their needs as well as ours? As this was my first digital project, I was new to user research, so I worked with colleagues in the Communications Team to try to work out the best way of engaging with our different users. We decided that a short online survey that would appear as a pop-up on our website would have the best reach, and we set about planning what questions to ask! Who exactly are our professional and public users? Why do they want to engage with the HTA? How are they trying to engage with the HTA at the moment? How do they use existing communication channels? What do they want to be able to do? We ran this survey for a month, as a popup on our website and promoted it through our social media channels and newsletters. We received great engagement from users – over 550 responses – and a really interesting set of results! The responses from our professional users were generally in line with what we expected – most were repeat visitors to our website, wanting to share their thoughts on how the HTA works and to expand their network to discuss topics related to the HTA, generally preferring digital methods to do so. However, the real surprise came from the public user responses – the vast majority were first-time users to our website seeking information on topics that they considered fairly personal and sensitive. As a result, users preferred to only discuss HTA topics with family and friends and did not express a strong preference to speak to other people, or the HTA, further as the website met their needs. We realised that an online forum would not meet the needs of our public users as we had initially thought! This shows the true value of user research in developing digital services that work for the user. From the results, we decided to focus on professional users, as there was a clear need identified there. To make sure that we really understood our professional users, we held five follow-up telephone interviews to fully understand their user journeys and further explore their survey answers. The deeper investigation at this stage of user testing proved invaluable in helping us to shape the next steps. We are now at the initial (Alpha) stage of testing our ideas. The survey and interview responses from our professional users demonstrated an appetite for an online engagement system. We plan to test out some user journeys with a small sample of our professional users in an online community setting, to evaluate if this works for our users. We are hoping that this testing stage will give us information to improve the online community further for our users so that we can build the best service for them. You really don’t need any experience to start understanding your users better. Remember that you’re trying to understand your users and not lead them to a particular response – we found who, what, when, why, where, how questions gave us the best answers that weren’t always what we were expecting!